Happy New Year, Spartans! We are proud of all that our students, staff, and alumni accomplished last year, and look forward to watching them reach new heights in 2019. With the spirit of a fresh start in mind, let’s talk about gratitude. It lifts up those around us and begins a cycle of positivity. It can humble us in times of trouble and lead us to lend a hand to others when we’ve found our way. It also happens to be Denise Busley’s favorite word. And that they did. 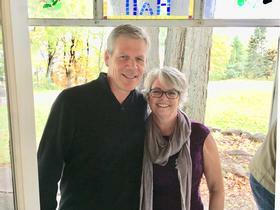 The couple received their first store location in Traverse City in 1996 when Mike’s Spartan ring was noticed by the proprietor. Liz Smothers, owner of Julian Pie Company in California, became their mentor and helped get the business started after securing the store. Today, Grand Traverse Pie Company boasts 15 locations across Michigan and Indiana. Mike serves as the President of the company, while Denise has taken a step back from the business to focus on spreading awareness of Adverse Childhood Experiences (ACEs). While much has changed since their first store opened, their commitment to local ingredients and communities has not wavered. “I’m a believer in humanity; at the end of the day, community is all we got,” notes Denise. Denise and Mike’s gratitude can be emulated as much as it can be admired. The MSU Alumni Association challenges all Spartans to consider how to incorporate gratitude into their daily lives in the New Year. While you ponder, check out Grand Traverse Pie Company for some delicious brain power. Know an extraordinary Spartan that deserves to be featured on our site? Use #SpartanStories and tag @msualumni on social media to let us know.